This module will teach you how to use the document viewer, and search within a document for a word or phrase. We estimate that this will take 4 minutes to complete. 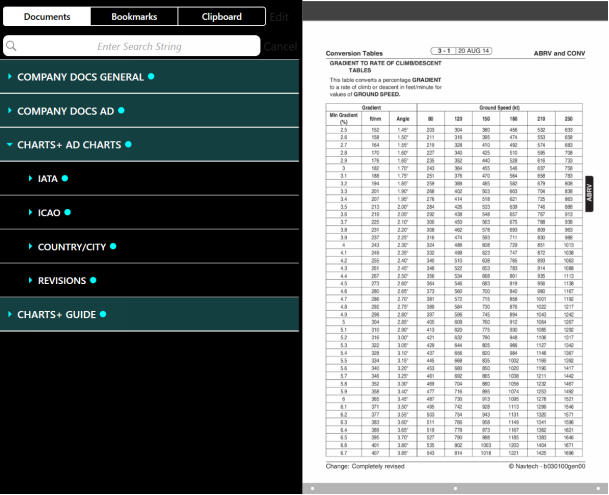 The document viewer is where you can view documents that are relevant to your operation. The document viewer will present you with up to four folders. date (WEF). Different version of the same document can be available. Future documents are with a time stamp value at the end of the name of the document indicating from when the document is valid. 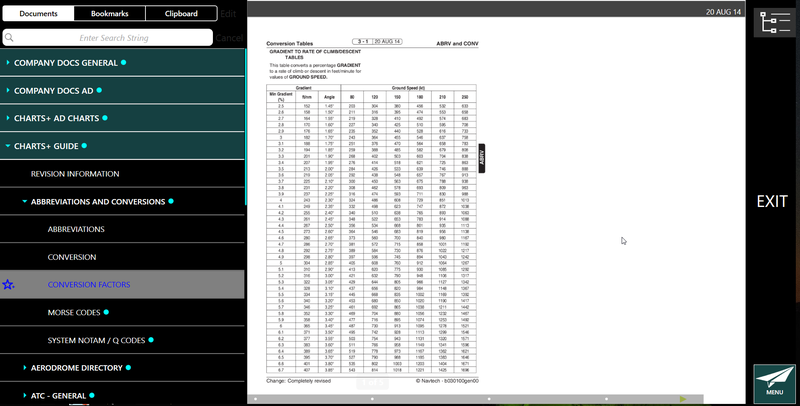 The application uses the device Date to determine when the document can be viewed according to its WEF. 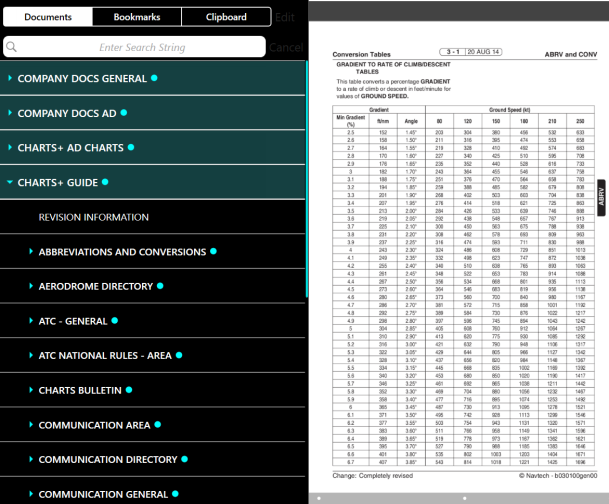 Future WEF documents also can be viewed in the document viewer. Once the document becomes effective, the documents loses the WEF time stamp, or WEF date. We will now have a look into the documents in more detail. Click the Documents list item. Making sure that the document tab is highlighted, you will be presented with a choice of up to four folders. Let's have a look at the Charts+ AD Charts folder. 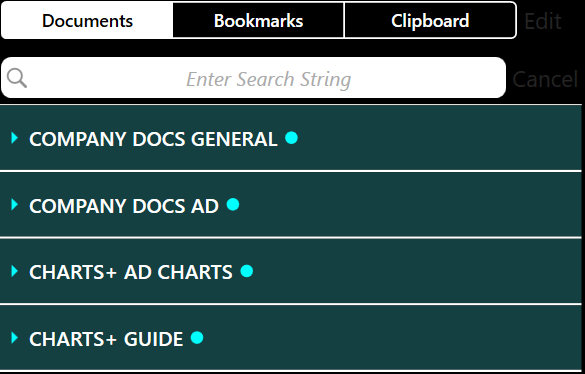 Click the Charts+ AD Charts list item. 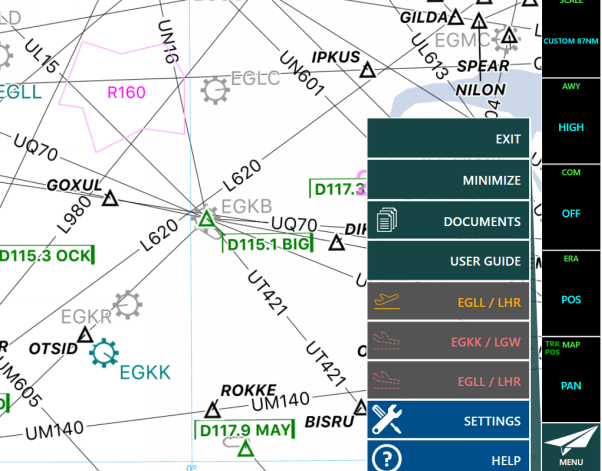 In this section you will be able to search for your aerodromes in your subscription. You can search for them either by IATA, ICAO and Country/City. The revisions folder will show any changes that have been made between the previous or future revisions. 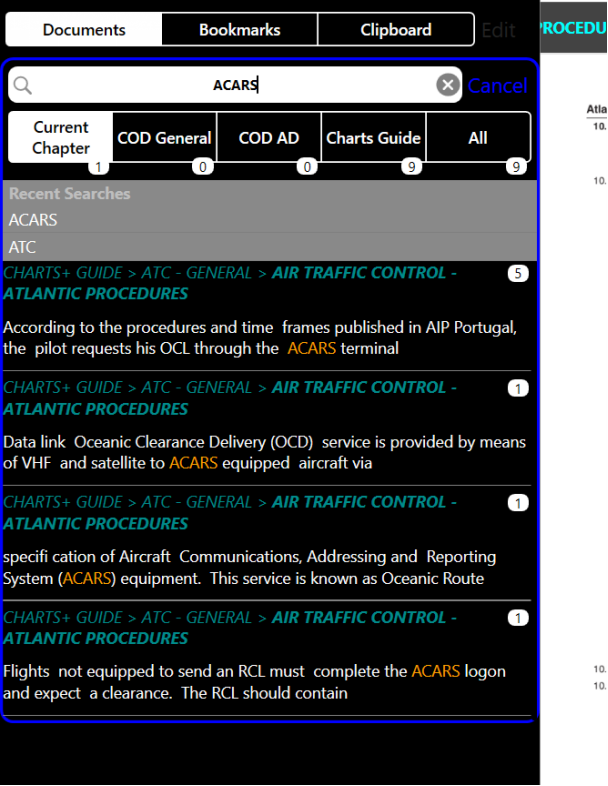 Click the ICAO list item. 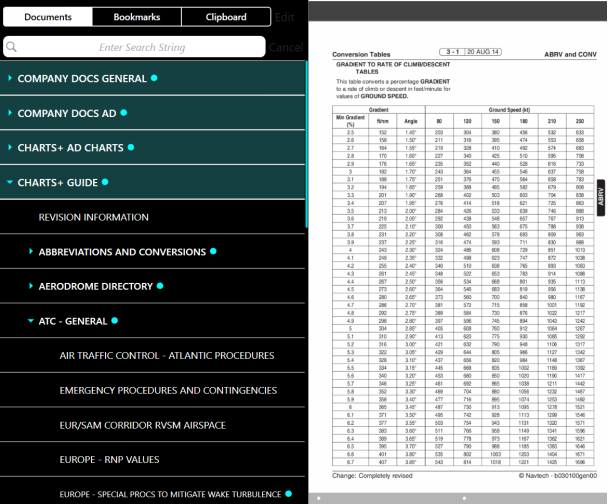 Within each folder aerodromes are listed alphabetically where you will be able to find the charts, bulletins and aerodrome information. 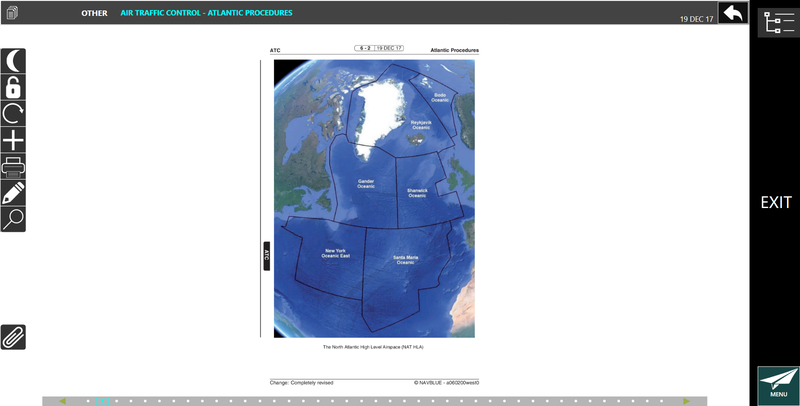 The Charts+Guide comprises of the relevant text pages such as communications, meteorology and emergency procedures. Let's look at a document within the Charts+Guide. 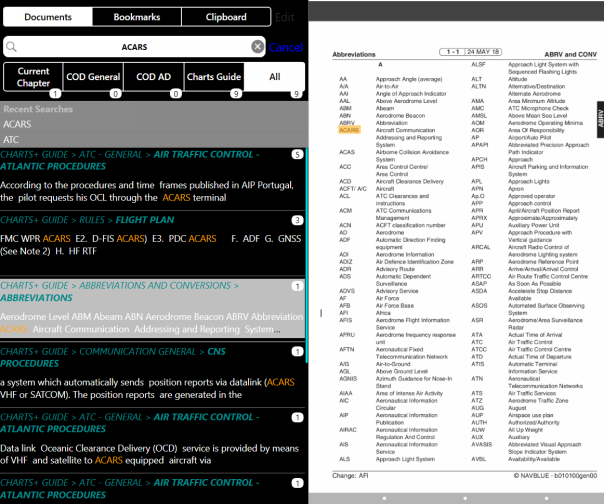 These pages supplement the aerodrome charts with communications, emergency procedures, meteorology, minima and general rules within the countries. 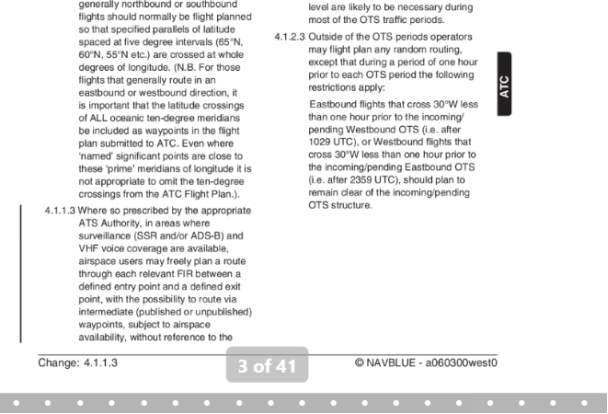 Let's have a look at ATC general document. 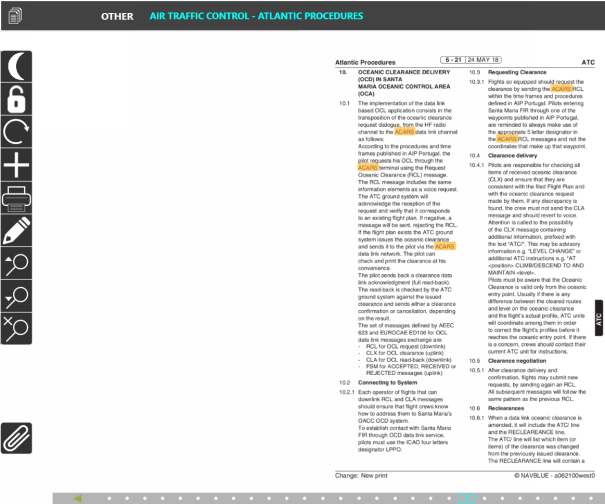 Click the Air Traffic Control - Atlantic Procedures list item. 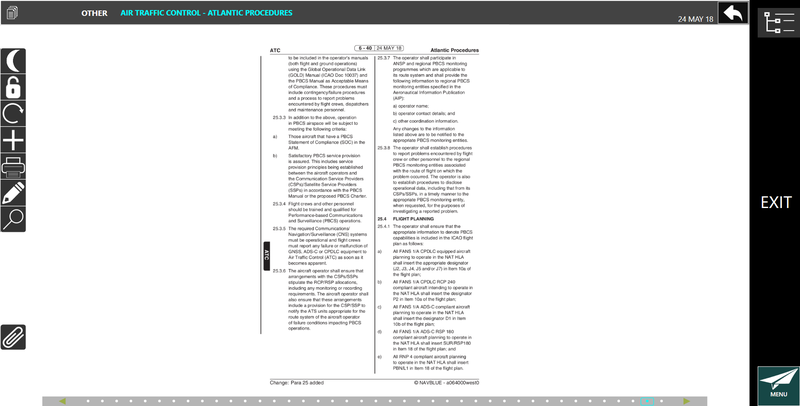 You are currently looking at the Air Traffic Control - Atlantic Procedures document. 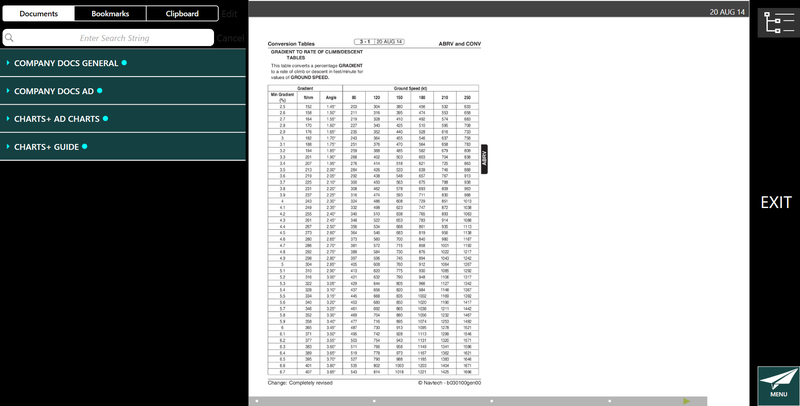 Within the document you will be able to swipe left or right to move to the next page. You will also be able to move through the document by using the green arrows located at the bottom of the document. Click to move to the next page. are currently viewing. You can also tap a white dot to move directly to a page, when you tap on a dot you will see the page number that the dot represents. You can go directly to a page by tapping the white dot, once tapped the page number will appear above the navigation bar. You have just moved to the next page. If you know the page number you can click on the page number above the navigation bar which will allow you to input a certain page number. 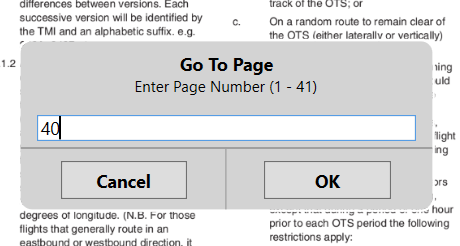 A "Go To Page" popup will allow you to enter in your page number. Enter 40 into the Search field. You are now viewing page 40. Let's now have a look how we can search for a word of phrase within a document. You can search within a document for a particular word or phrase that you would like to find. This can be done by using a search feature included within Charts+. Let's have a look at searching for the word ACARS within the documents. If you put more than one word with a space between them, the search engine interprets the query with "or"
Starting in the document section use the search string to enter in a word of phrase to search for. Recent search results are displayed in the box below the search box. Let's start our search. 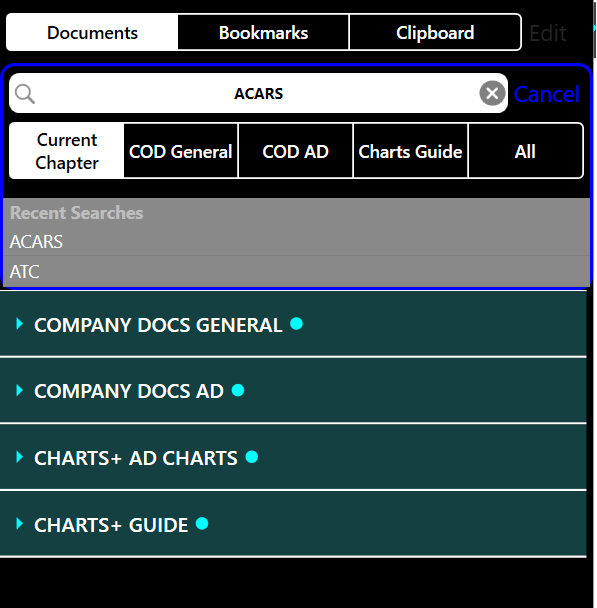 ■ Company Own Documents General (COD General) - These are the customers own documentation that they wish to be published and can be viewed when accessing the Documents. These are not specific to an AD and have been uploaded by the customers EFB administrator. ■ Company Own Document Aerodrome (COD AD) - These are associated with an AD reference. You will see a Cyan dot above the Port Pages icon if you have unread COD for that specific AD. meteorology, rules and many more for your coverage area. Enter ACARS into the Search field. You can see here the number of search matches per category per page. Let's go to "All" to view the list. Search results will appear below in the document tree view. The results show a preview of the search word that was used along with a number of results on the page. 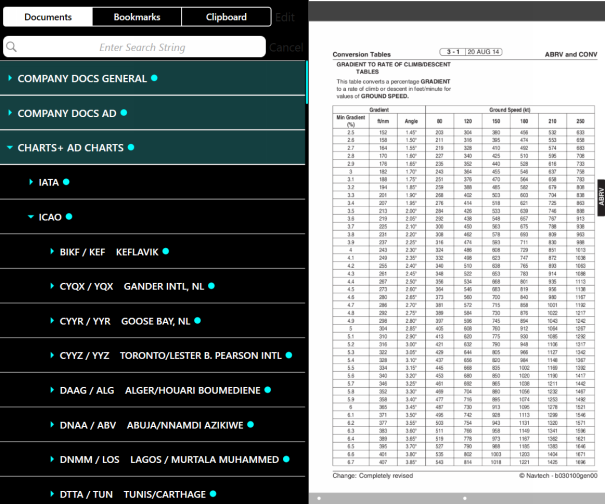 The location of the document and title as applicable will be shown in cyan for every search result along with the corresponding chapter. You will also see the context of the first search result. Let's have a look at the following page. 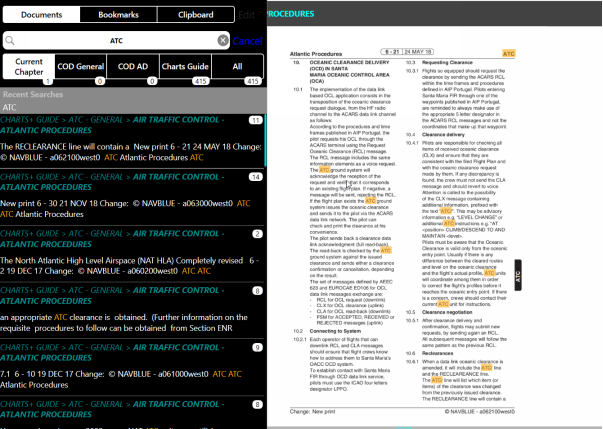 Click the Charts+ Guide>Abbreviations and conversion>Abbreviations list item. You can see the only time the word appears on this page. 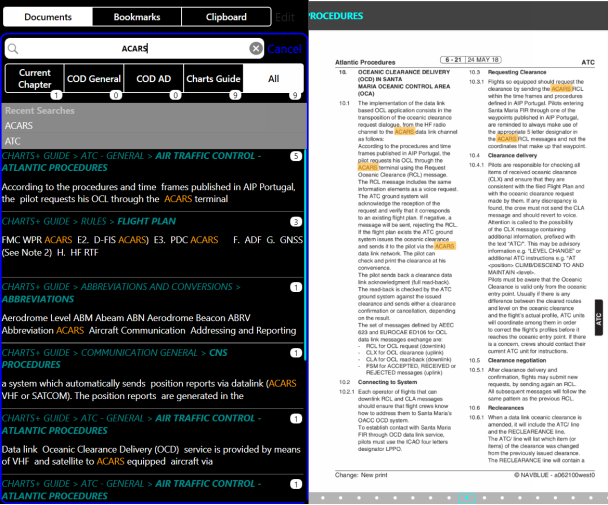 Search results are highlighted in the documents. Let's go and look at another page. 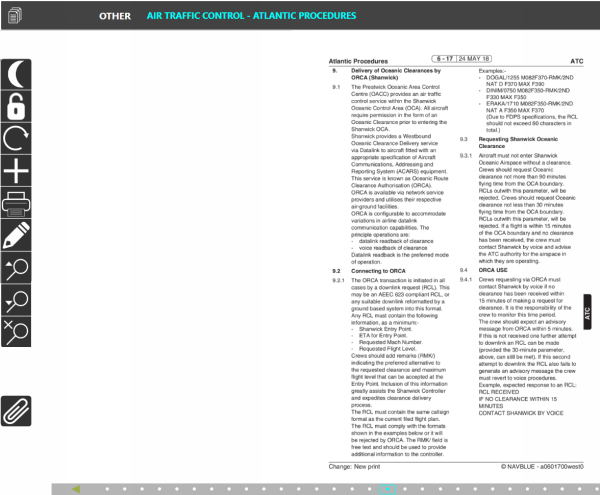 Click the Charts+ Guide>ATC>General>Air Traffic Control - Atlantice Procedures list item. You can see your word has been highlighted five times on this page. Let's now have a look at navigating through our searches. The following three icons are available when you access a page from the search result. The first two icons will navigate you back and forward through the search results. They are grayed out when you reach the beginning or end of the results. They will both be grayed out if there is only one result returned. The last icon will close the navigation icons leaving the search icon displayed. You will remain on the page you are currently viewing. Click the Navigate back button. You can see that only one result is shown and the button has been grayed out, so you can only navigate forward through the results. Let's close the navigation display. Click the Close navigation button. You will see a Cyan dot besides a folder or a document name if there are any unread documents in the folder or if a document has not been viewed yet. 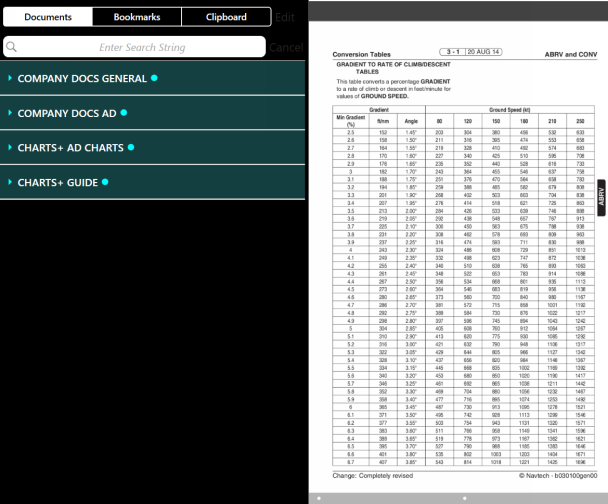 Once the document has been viewed the dot is no longer displayed.